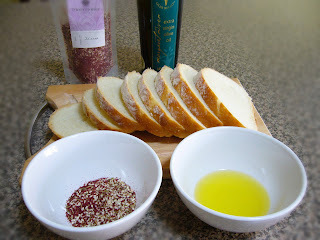 The second part: to dip the piece of bread into olive oil then dip it again in dukkah. I learned this from the Egyptian man who owns a stall in Wanneroo Market. I didn't try to make the Za'atar shown in the photo above. Olive Oil and the Za'atar were purchased in Margaret River. I have the recipes for both Za'atar and Dukkah. Will try it one day and will put up the recipe + photos plus comments.